This is the MOST effective strength training for the "other guy", you know, they guy who doesn't JUST want strength, but wants it all. More importantly, I am a father to an amazing son and husband to an incredible wife, and I would like to personally welcome you to One Man One Barbell, Highly Effective Strength Training...for The Other Guy. I am also one of the “other guys”. You know, the guy who wants to be incredibly strong, but doesn't want to be a meathead, or sacrifice all other areas of fitness and health for the sake of strength. The guy who wants to be really strong AND really fit. The guy who has always been told, “that’s not possible”. I’m here to tell you it is possible. I am a fitness minimalist; less is more. Less equipment, less fluff and filler...only results. I’m the guy who achieved a 500lb deadlift (watch me deadlift 500 lb.) training alone, with only one barbell, and nothing more. The One Man One Barbell system is a culmination of 10 years of experience and over a year’s worth of testing and refinement and reading and research aimed at one thing…making you the strongest human you can be. You'll hear that over and over..."system"...that's because One Man One Barbell is not just an eBook it's WAY MORE than an eBook - it's a system. Become the strongest you've ever been, without spending hours in the gym...Learn how to move more volume quickly and learn why it is effective. The strength sessions are quick and effective and leave you more time to do what you need. Includes Version 1.0 and Version 2.0 of One Man One Barbell for intermediate and advanced lifters. Include the "Ground Zero" system for beginners. One Man One Barbell effectively implements the 3 most proven strength training methods in the world, and teaches you why it's effective. The mobile guide and calculators will help you track your progress, and will teach you how to put it all on your smartphone for your convenience. Learn all you need to know about strength training and barbells; which bars to buy and what to avoid. One Man One Barbell Works...Quickly! Ben had those results after one cycle of One Man One Barbell, and I'll let you in on a little secret...One Cycle is only 3 weeks of heavy lifting and 1 week of reduced volume...4 weeks! And each training session is only 30-40 min long. What have you got to lose? There aren't many strength training systems out there, so here is One Man One Barbell broken down piece by piece to give you a better understanding of exactly what's in this thing. We took all the functionality of The Ultimate WOD Log (click to watch video) and added One Man One Barbell elements and calculators. And a Laundry list of AMAZING accomplishments you can read here. It's tested! OMOB is not some theoretical strength program. It was originally created for, and tested on, athletes part of the Eo3Fit training team. It was only once the true potency of the program was realized; with athletes varying is shape, size, gender and athletic background that One Man One Barbell was turned into this guide. It depends. There are many effective strength training guides, systems and books on the market today. However, most other systems out there are focused on getting you strong...but that's it. This creates extremely long training sessions and leaves you no time for any sort of conditioning. One Man One Barbell was created to be extremely effective with short training sessions. This leaves you time to do your own conditioning, or use the One Man One Barbell Conditioning program, found in the deluxe version. Also, we use PayPal's secure network to accept all transactions, so your information is all kept private and secure at all time. I am confident One Man One Barbell will work for you, so give it a chance! Try the program for 30 days, if you aren't seeing the results you expected, email me and I will gladly issue you a 100% refund, no questions asked. One Man One Barbell has worked for CrossFit Games athletes, stay at home moms and people like me..."the other guy", I'm thinking it will work for you! Are you ready to stronger fitter and healthier? Let's do it! 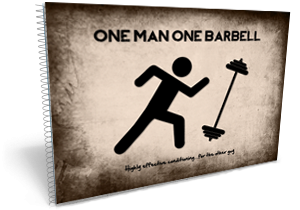 There are two versions of the One Man One Barbell guide, basic (without conditioning and my log) and Deluxe (with conditioning and my log). This is a digital product, so you will be using the One Man One Barbell system and on your way to busting through PR's moments after you purchase. I have poured my heart, soul, sweat and everything else into this program, and I am confident that what I have created will work for you. If you are still on the fence, keep in mind the money-back guarantee. All I ask is that you try out One Man One Barbell for 30 days and then let me know that you're not seeing the results you expected and I will give you a 100% refund, no questions asked. I really just want you to try it out, be happy, be fit, be healthy and be strong. The money-back guarantee is available for up to 60 days after purchase. Seriously, I don't have gimmicks. I don't have tricks. I don't have "ACT NOW OR ELSE!!!" ... plastered all over this site. What I do have is a proven guide that will get you stronger and in the best shape of your life. If that sounds good to you, give One Man One Barbell a try, you won't regret it. And just a reminder...there is a 100% money-back guarantee, so what are you waiting for?